HEY, SAN JOSE: Tonight marks the first of eight meetings with the Barracuda this season, and the first of the Roadrunners’ four scheduled visits to San Jose’s SAP Center. The Roadrunners are playing the first of a two-game road trip; they’re coming off of a 5-2 win over the Ontario Reign Tuesday night. The Barracuda are playing the final of a two-game home stand; they’re coming off of a 6-0 loss to the Stockton Heat Wednesday. 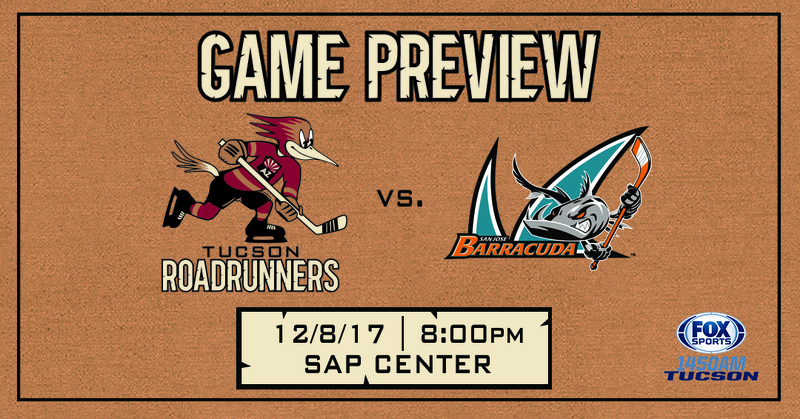 GETTING FAMILIAR: The Roadrunners will see the Barracuda in three of their next four games; San Jose will make its first visit to Tucson Arena for a pair of contests Tuesday and Wednesday. Divisional games are important; the Roadrunners are in the midst of a stretch of 28-straight games against Pacific Division opponents. They are 5-3-0-1 through the first nine games of their current Pacific push. KEEP ‘EM QUIET: San Jose enters the evening with the AHL’s 28th-ranked offense, scoring an average of 2.58 goals per game. Tucson’s defense, ranked 6th in the league, is allowing an average of 2.72 goals per game. The Barracuda were shutout Wednesday night in their worst loss of the season to date. PROJECTED LINEUP: The team held a pregame morning skate ahead of tonight’s game at SAP Center. Per club policy, specifics regarding the team’s lineup will not be published until 6:00 PM this evening. MERKLEY MAGNIFICENT: With two points (1G, 1A) registered in Tuesday night’s 5-2 victory over Ontario, Nick Merkley is tied with Rochester’s C.J Smith for first among active AHL rookies in scoring with 23 points. Merkley’s 12 goals are tied with Charlotte’s Warren Foegele for first among AHL rookies and tied for third among all players in the league. He has nine multi-point performances in 18 games played thus far; can he spark the Roadrunners’ offense yet again tonight? ROAD TERRITORY: The Roadrunners have played 11 of their last 13 games on home ice. 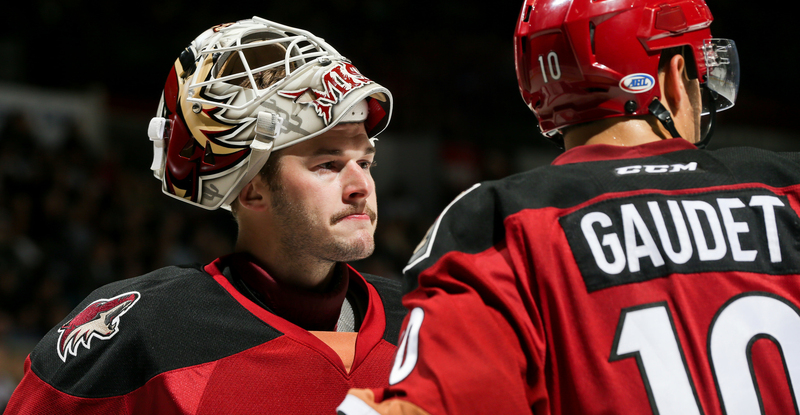 They carry a 3-1-1-1 record away from Tucson Arena into tonight’s contest against the Barracuda. San Jose is 6-5-0-0 at SAP Center this season; can the Roadrunners improve their road record with a win tonight? BUNTING’S HUNGRY: Michael Bunting has doubled his season point total in his last four games, accumulating four (1G, 3A) during that span. Showing a consistent knack for getting to the net, hitting the dirty areas, his ‘buzz-like’ presence could be of great use to the Roadrunners against a struggling San Jose defense. TAKING ADVANTAGE: The Roadrunners scored three power play goals in their previous game, the most by the club in any single game this season. They enter the evening with the AHL’s third-best power play, chiming in with a 22.6% success rate (24-for-106). THE LAST TIME AROUND: The Roadrunners posted a 3-4-1-0 mark in eight meetings against the Barracuda last season, including a 2-2-0-0 record in their four visits to SAP Center.